As a homeowner, you do everything you can to protect your home, family, and belongings. You also know that your residential garage doors Pittsburgh are one, if not the main point of entry into your home. If a garage door is left open or unsecured, it can be an open invitation for burglars to enter your home without opposition. Here are a few security tips for your garage door that you can implement to protect your home and discourage burglars from entering your home unwelcomed. One of the easiest and more convenient ways to secure your home is to monitor every entrance, including the garage door, by having a complete home security system installed. Homes that are equipped with a security system deter crooks from trying to enter. High-quality alarm systems are designed to not only alert you of an intrusion but also emergency personnel. Most alarms are not silent, scaring off crooks and preventing them from entering or lingering in your home. The one drawback to having a home security system is that depending on how many doors and windows you have and how comprehensive your security system is, it can be quite costly. Windows in garage doors can be both good and bad. 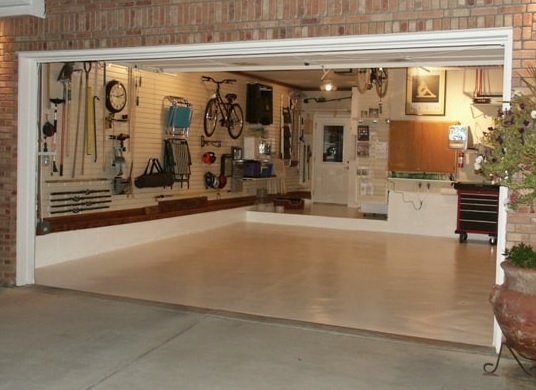 Windows allow natural light to flow into your garage, cutting down your need for lighting. On the other hand, these same windows can provide would-be burglars the ability to easily see what is stored in your garage and how easy it is to enter your home via your garage. One of the easiest ways to protect yourself is to cover these windows to prevent people from seeing inside. You can achieve this by placing a decorative film or tint over the glass. Both of these options allow natural light to shine in while making it more difficult for someone to see inside. If you’re concerned about nighttime break-ins, having a well-lit home will make you less of a target. A good way to protect your home is to install motion-active lights around the exterior of your home. A good location for a motion detected light is above your garage door, so when someone walks or drives up the light kicks on. These lights serve a dual purpose, not only do they deter people from approaching your home unwanted, but they are also helpful for when you return late at night. This tip might seem like an obvious one, but you would be surprised to learn how many people forget to shut and lock their garage door at the end of the day. Be sure to shut your garage door every day to prevent easy access to your home. While not every residential garage door Pittsburgh is equipped with a lock, those that are should be locked daily. If your garage door doesn’t have a lock on it, you might want to consider looking into having a locking system installed on it for added protection. If you have questions about your garage door or need a repair to provide your home with optimal security, contact Thomas V. Giel Garage Doors today! We can help you repair or replace your existing garage door to provide your home with added security and you with peace of mind. At Thomas V. Giel Garage Doors, we can help with all your residential and commercial garage door needs. You want to add curb appeal to your home, but where do you start? What’s the Difference Between Torsion and Extension Springs?